The 10 Best Pumpkin Picking Spots in New Hampshire! Fall means it’s time for pumpkins. For some that means pumpkin spiced lattes in their favorite coffee shops. For others, that means visiting a nearby pumpkin patch where they hand pick the brightest, fattest pumpkins for a variety of uses! Some carve them into jack-o’-lanterns for Halloween. Others work them into a lovely fall scene in their yard or on their porch. Still others plan on lots of baking with their pumpkins, envisioning pumpkin pies, pumpkin bread, pumpkin cookies, and more. So what are you waiting for? Take your pick at these amazing pumpkin patches in New Hampshire. You’ll love the pumpkin patch at Sunnycrest Farm. The pick-your-own farm is known for its seasonal produce and home baked goods. Their donuts are seasonal favorites. Bring home a family of pumpkins for your Halloween display. Pick the perfect pumpkin from the patch at Riverview Farm, where you’ll also find an interesting selection of squashes and gourds. The farm offers pumpkins both big and small. The pumpkins are ripe for the picking at Brookdale Fruit Farm. Visitors may pick on Monday through Friday from 8 a.m. to 3 p.m. and on Saturday and Sunday from 8 a.m. to 5 p.m. Call ahead on weekends to see what the special scheduled event will be. There will be hayrides, animal exhibits and more. Stone Brook Hill Farm’s pumpkins are available starting the last few days of September, and will continue to be offered throughout October. Bring the whole family and take some excellent family photos in the pumpkin patch. This location is not pick your own but offers plenty of plump and vibrant pumpkins to bring home. Rossview Farm will sell the pumpkins from their ample patch beginning at the start of October and will continue to sell throughout the month or until the pumpkins run out. Be sure to pick up some of their real maple syrup when you visit. The pumpkin patch at Applecrest Farm Orchards is a favorite of visitors from the New Hampshire seacoast. Walk or take a hayride to the patch. Be sure to visit the farm store for seasonal fruits and vegetables and delicious apple cider donuts. A two-time People’s Choice award winner in the “Best of New Hampshire” edition of New Hampshire Magazine, the pumpkin patch at Mack’s Apples is a pick-your-own experience you won’t soon forget. The Mack family has farmed this land since 1732, and they’ve only improved upon their crops throughout the years. Theirs is the oldest family run farm in the Granite State. 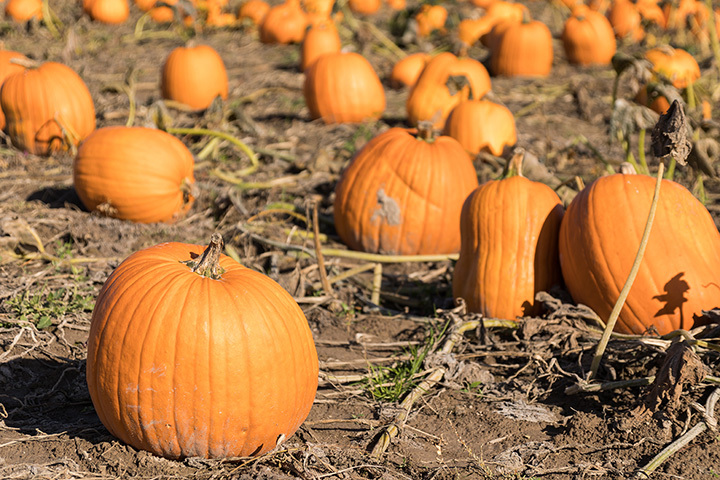 Walk or take a hayride out to the pumpkin patch at DeMeritt Hill Farm, where you’ll find pumpkins galore. Visit the farm animals and stop into the farm bakery during your visit. You can easily spend a half day exploring farm living up close and personal. Pick your own pumpkins in the Scamman Farm pumpkin patch or visit their farm stand and buys pumpkins that have already been picked. Either way you’ll find an incredible selection and a variety of sizes. Enjoy a hayride to the pumpkin patch, then pick to your heart’s delight at Moulton Farm. Consider booking one of their farm to table dinners before you go. Be sure to check out the delicious pies in the farm store, too.